We are quite enjoying the rolling costal hills. 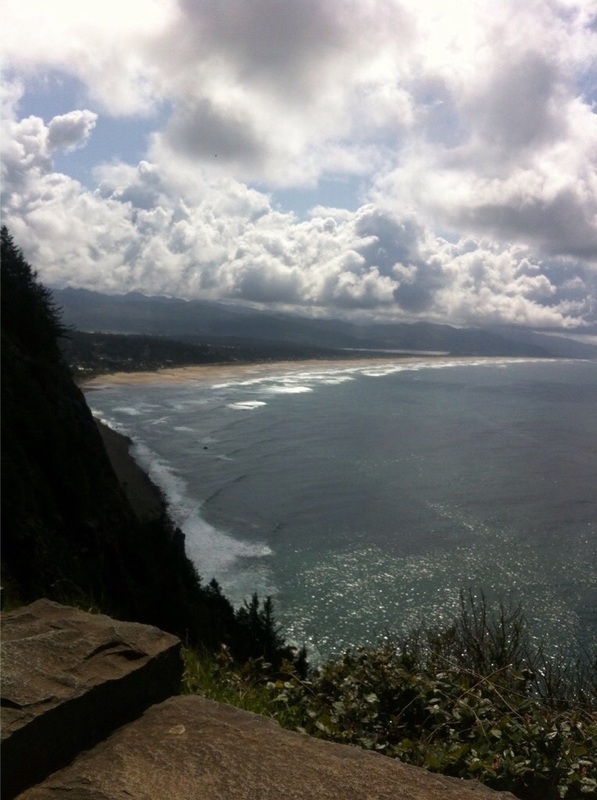 So far the Pacific Coast of Oregon has provided many visual highlights. 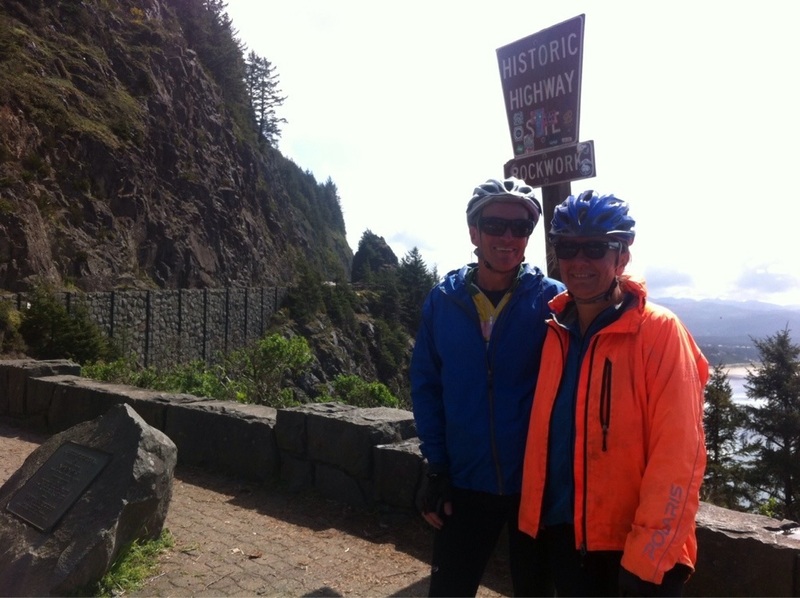 The last couple of days conditions have improved; light tailwinds with accompanying warm weather have helped make the miles of steeply narrow road enjoyable, as we have ridden through some beautiful coastal forest. Taking our time, we stop as the mood takes us to survey the sights sounds and smells. A good early morning cup of tea by the seaside at Cannon Beach was luxurious. Ahhh the simple things in life really are the best. The climbing and subsequent descending continued as the roadside shoulder appeared then disappeared like magic, just when you need it most. The Cape Arch Tunnel runs uphill and bends to the left. 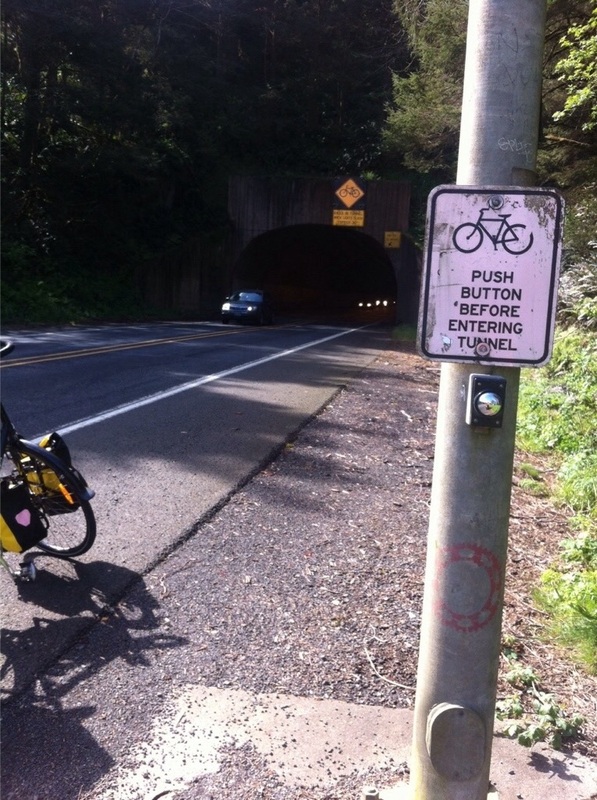 Before entering the Belly of the Beast cyclists must push a button to activate flashing lights that alert cars, logging trucks, fifth wheelers and anybody else interested in hunting cyclists, that we are in the tunnel. Therese road in front as fast as she could, singing Helen Reddy’s I am Woman, at the top of her voice, while I yelled “faster, faster!” from behind. The noise was deafening and the metal grates we cycled over added to the drama! 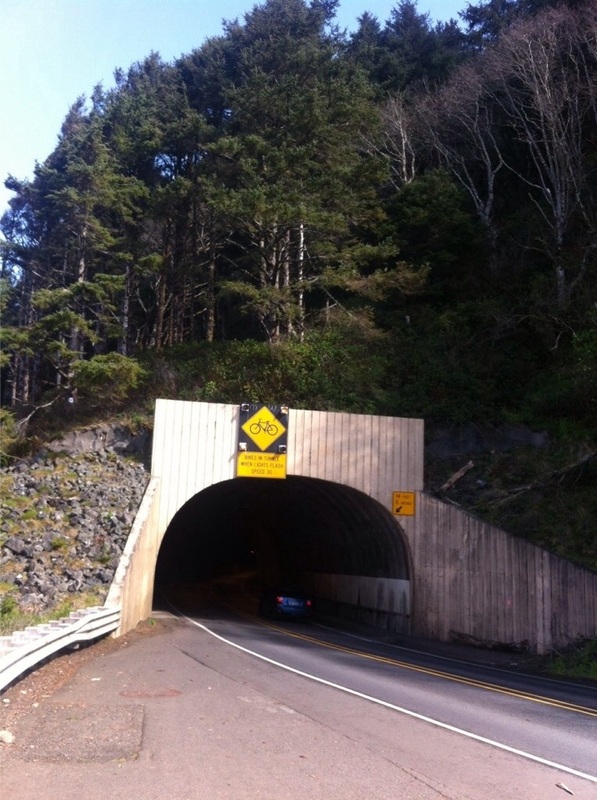 After the tunnel we caught our breath then the road went uphill for several miles until we reached the most scenic of scenic lookouts out across the Pacific Ocean and down into Manzanita. 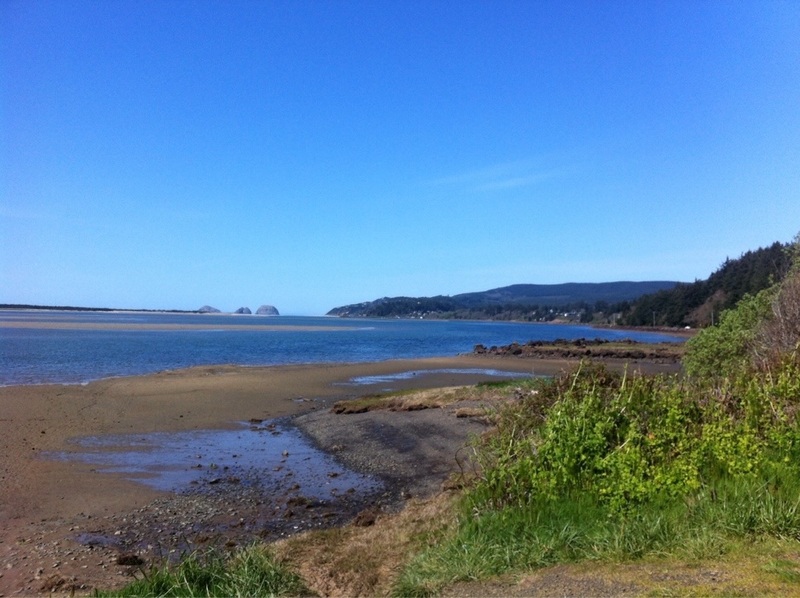 A little further on from Manzanita we arrived at Nehalem Bay State Park. After setting up camp in the designated hiker biker area, $12.00, we went walking along the trails, mindful of the park signs warning of cougars, raccoons and bears. The recommended course of action if attacked by a bear is to fight back- sound advice! We also met Colin a young touring cyclist towing a BOB trailer. A clear cold morning would translate into a warm day, but not straight away. Therese met a couple of wondering Elk as she was returning back from her morning ablutions. Wow! We then warmed up at the nearest cafe, still struggling with the menu items, I play it safe: Plain white toast. I felt like Elwood from the Blues Brothers. Once again the costal views are breathtaking, the roadside shoulder comes and goes as the road rises and falls to greet us. 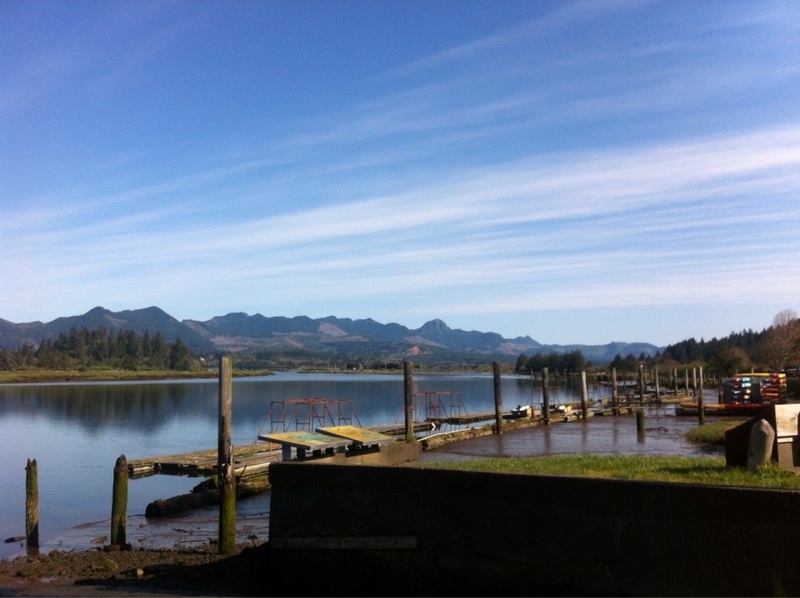 At Tillamook we stop at the cheese factory where we meet up again with Colin. The place is really crowded. “The cows must be working overtime!” I said to a non plussed shop assistant. 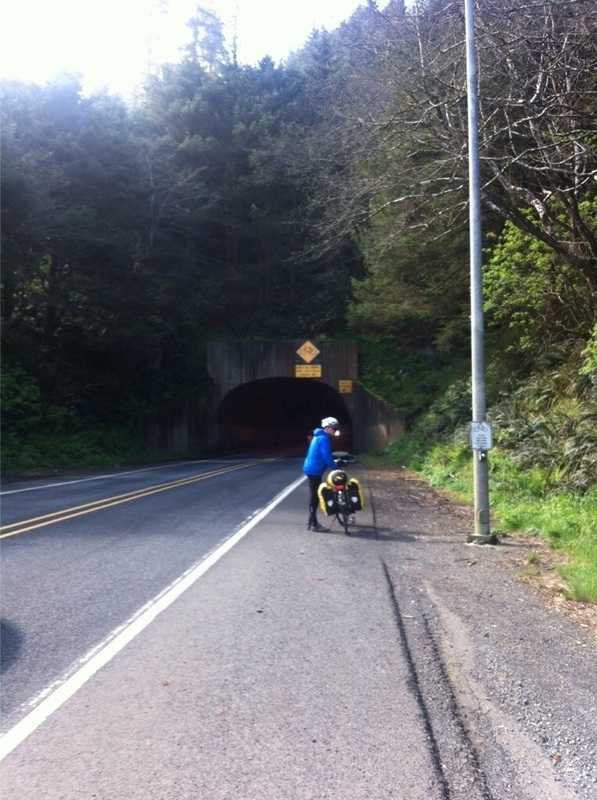 Outside Tillamook the shoulder completely disappeared, essentially feeding us into the traffic. 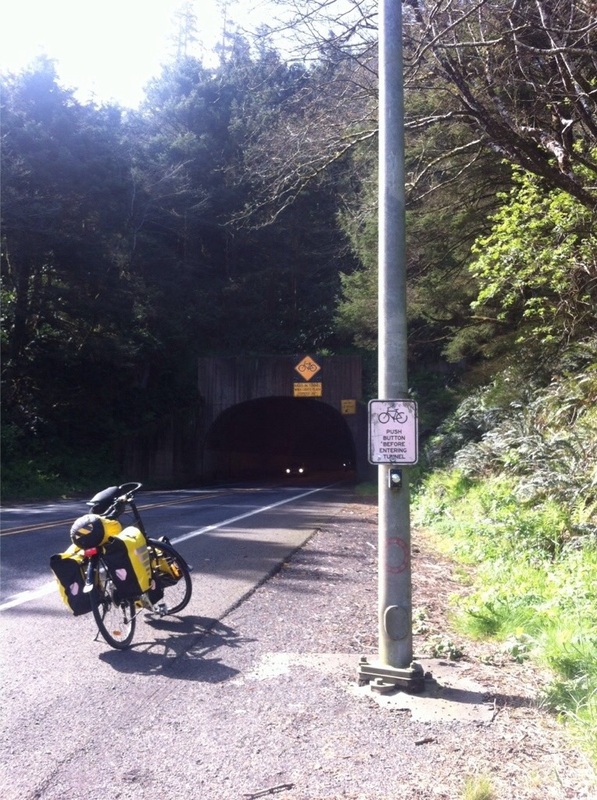 A few tense miles, then the turnoff to Cape Lookout State Park, its beautiful here. Our hiker biker site is set just back from the beach right in the forest. tonight we will be lulled to sleep by the waves. We walked along the beach and saw surf fishermen try their luck. 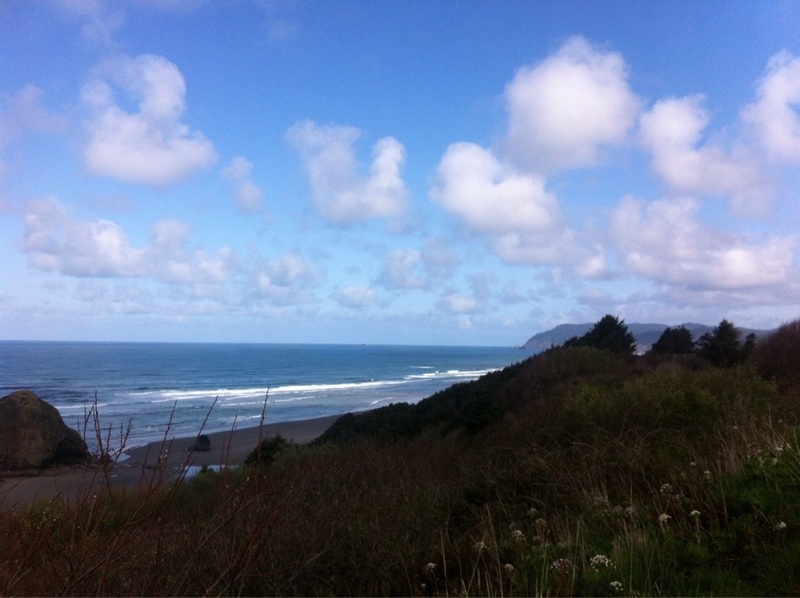 Therese and I sat up on the bluff staring out to sea where we spotted a couple of grey whales, mother and calf. Another in an increasing list of wow moments!